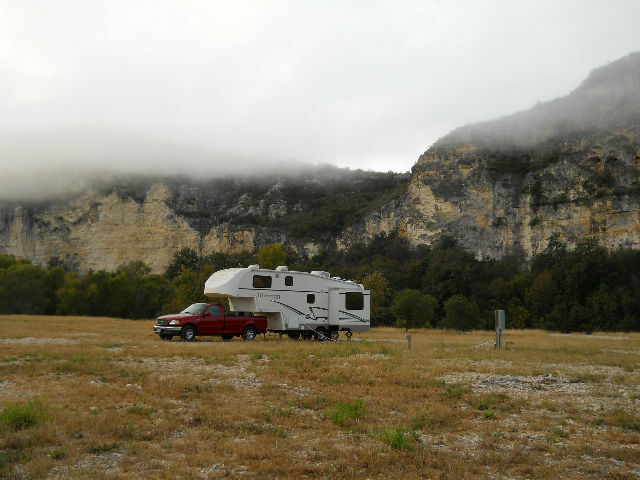 Fall and winter are the best times for camping in Texas. The temperature and humidity have moderated from their Summer values. 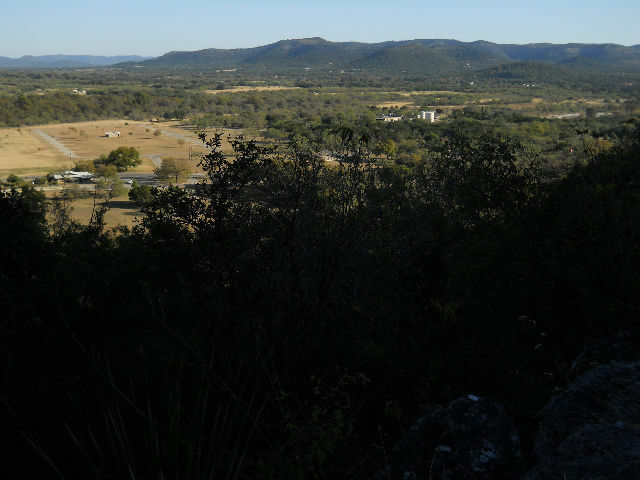 The Hill Country is always a favorite place for us. 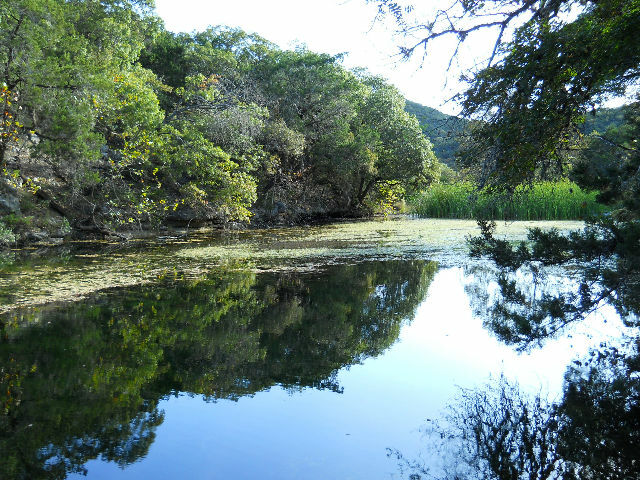 We enjoy the hiking, birdwatching and the beautiful landscape. As a bonus, we usually stumble onto some interesting Texas history. This trip was no exception. 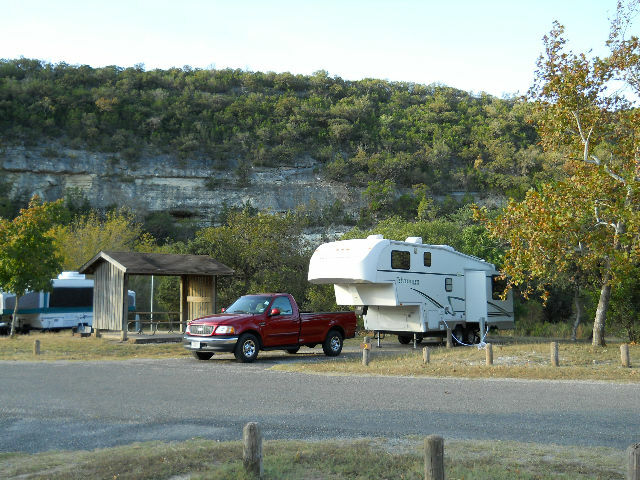 We started out by staying 4 nights at Lost Maples State Natural Area, 2 nights at Garner State Park, 2 nights at Chalk Bluff Park and finally, 2 nights at Castroville Regional Park. Each was different in their scenery and attractions, and each was worthy of a future visit, if the opportunity arises. We hope you enjoy the story of our vacation. [Monday] October 25th we left Richmond about 10:30 am, after stopping at the local Kroger to stock up on last minute items to carry us for a week away from stores. We drove up TX-99 to I-10, then west toward San Antonio. 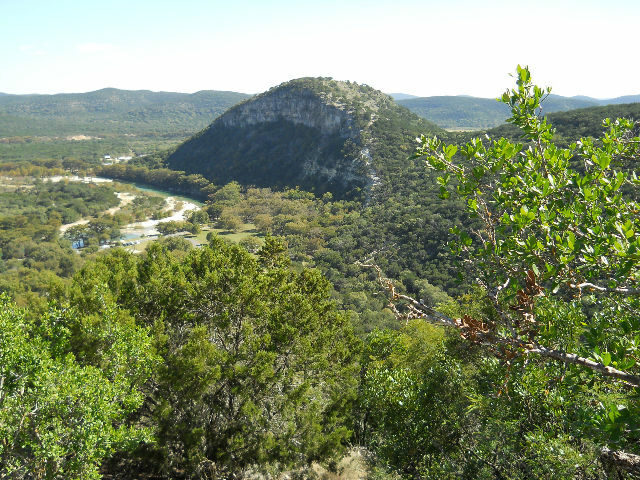 At Seguin we took TX-46 northwest to Boerne and continued west to TX-16. At Medina, we turned west on RM-337 to Vanderpool. This is a very beautiful drive through the hills but there is one very steep hill that we barely made it up with the trailer. On the other side it was a "use lower gears" descent. 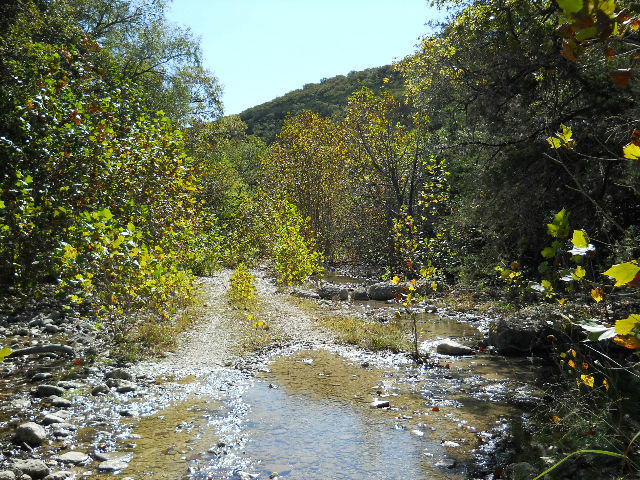 At Vanderpool we turned north on RM-187 to Lost Maples State Natural Area. We arrived a few minutes after 5pm and settled into campsite #6. The campground was fully occupied for the entire 4 nights we stayed. 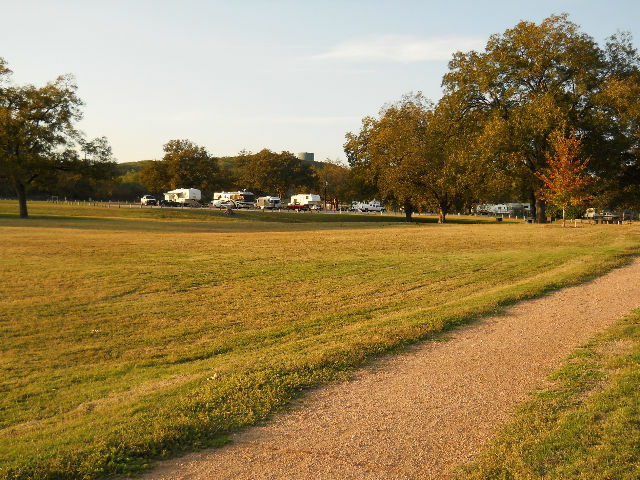 This is a very popular campground, especially this time of year. 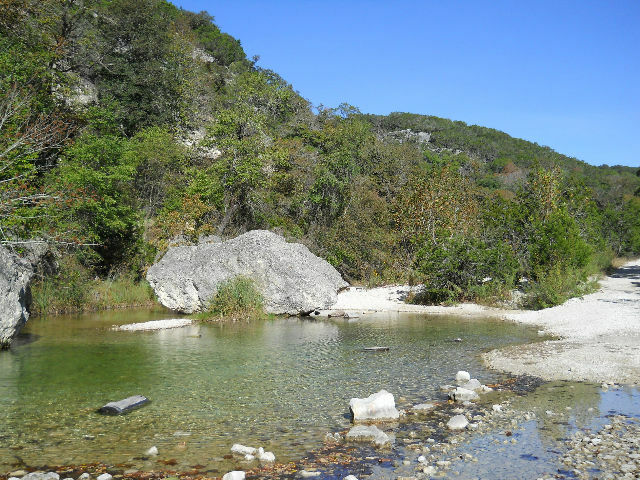 < Our campsite at Lost Maples State Natural Area. 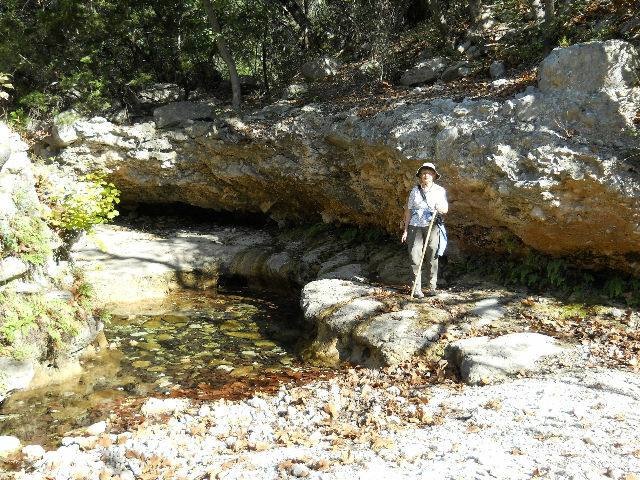 [Tuesday] After breakfast we hiked on the Maple Trail to where it joins the East Trail, then back to the beginning. 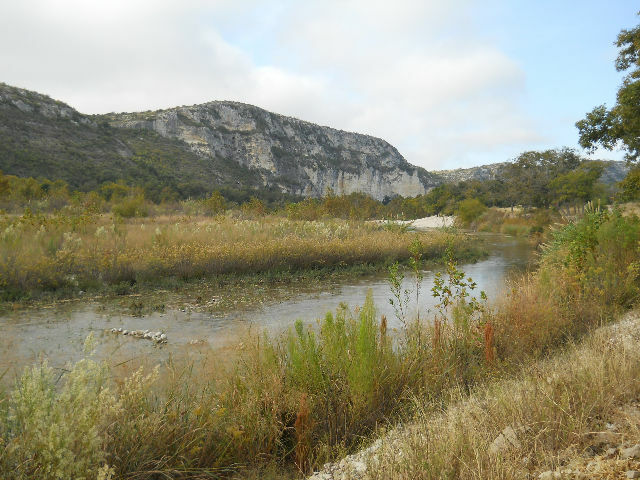 It is a easy walk along the edge of the Sabinal River and is about a 0.8 mi round trip. It is very scenic any time of the year. We then went over to the west end of the East Trail and walked along it until we got to the junction with the West Trail. We returned and went back to the trailer for lunch. We spent the rest of the day at the campground. < Scene along East Trail near Maple Trail. 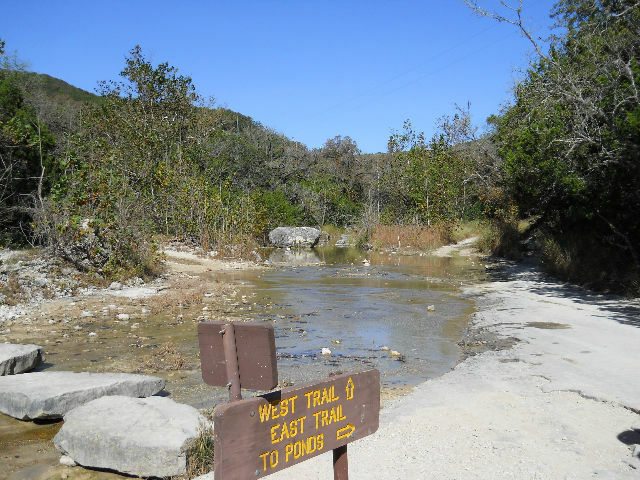 < Junction of East & West Trails. [Wednesday] This morning we decided to hike the entire East Trail after breakfast. We knew that this would be a challenging trail, so we packed a picnic lunch. We started on the west end and walked the trail from west to east. There is a steep part that lasts about a half mile going up to the top of the hill and another steep part going down on the other side. There are loose rocks, especially on the west ascent, that make for a tricky hike. 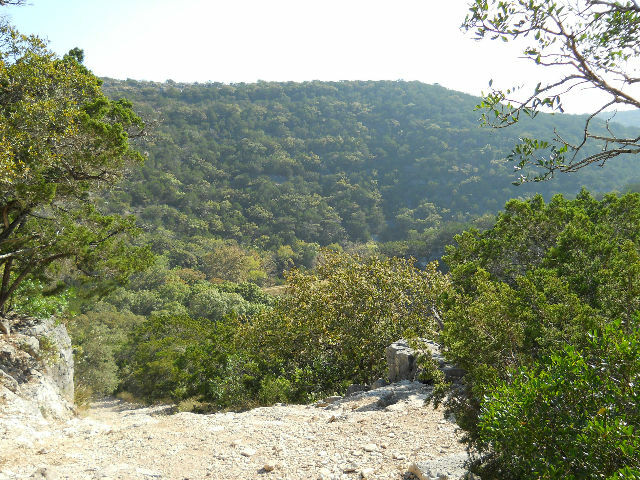 We ate our picnic lunch on the top near the scenic overlook in the shade of a bush. The view from the top is breathtaking, to match the climb up to the top. The sun was hot after a very cool morning (50F), and we wilted in the heat. The trail is about 5 miles long, but it seems a lot longer since it is so steep. We got started about 10am and finished about 3:30pm, including a 30 minute lunch at the top. < Scenes along the East Trail. After we got back to the trailer, we drove south on RM-187 looking for a Verizon cell phone signal so that Kay could check up on her mother at the personal care home. We didn't find one all the way to Utopia. There we stopped at a cafe with a pay phone sign and found out that the pay phone didn't make long distance calls. Fortunately a very kind waitress in the cafe allowed us to use her AT&T cell phone to call back to Katy. Wow! [Thursday] In the morning we hiked the West Trail to its junction with the West Loop Trail and turned around and returned. The trail continues up on top of a hill and back down, but we decided to save that part for the next time we visit the park. We left about 9:30am and got back about 12:30pm. 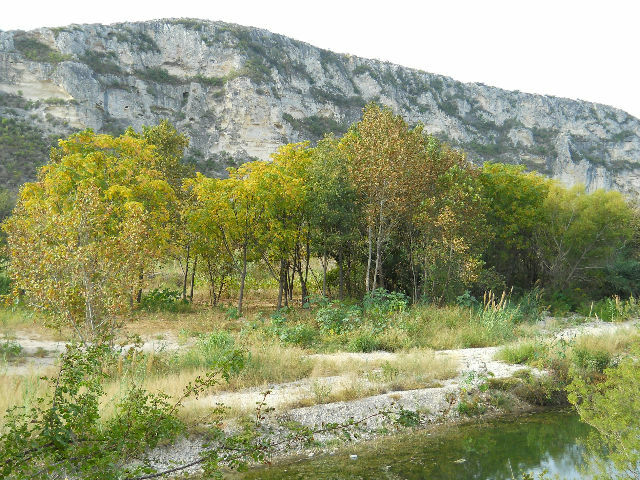 The trail mostly follows the Can Creek and goes past the ponds and is fairly easy to walk. 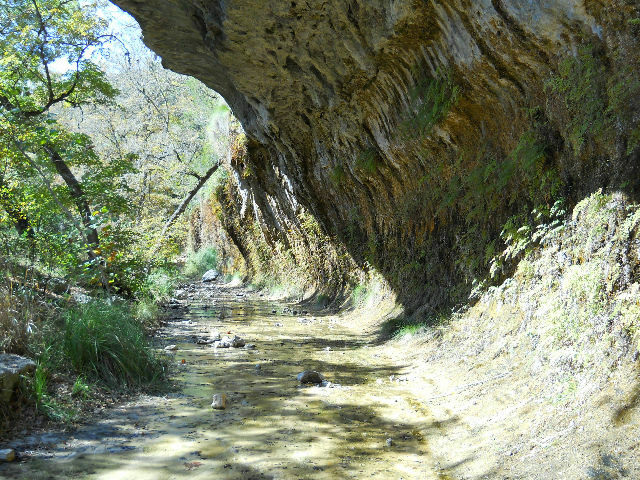 It is a nice trail and you ford the creek several times. It also goes past a spring and little pool of water. The weather was cool and windy - a coldfront was coming through. After lunch we stayed in the campground and read some and did our Bible study for the Kay Arthur Precepts series we are taking on Revelation at our church. [Friday] We had to get out of our campsite today because our reservation ran out. The park goes crazy on the weekends and so many people come that they have to turn people away to prevent overcrowding. Camping spots have to be reserved months in advance. We left about 10:30am and drove south to Utopia, where we stopped at the Lost Maples Cafe and had a great Mexican lunch special. Another friendly waitress loaned us her AT&T iPhone to call back to Katy to check on Kay's mother. Based upon our experience, AT&T's coverage is better in rural Texas than Verizon's. Afterwards we took RM-1050 to Garner State Park, where we arrived around 2pm. 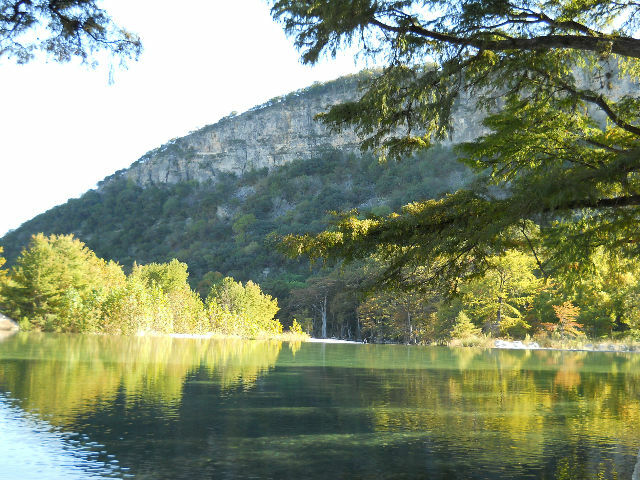 Garner is a very large state park bordering the Frio River. They have hundreds of camping sites and are usually filled up on weekends, but we happened to be here on Halloween weekend, so they weren't full. But there were plenty of folks. After setting up in site #137, we drove through the park and stopped at the small lake where they dam the river to make a swimming hole. 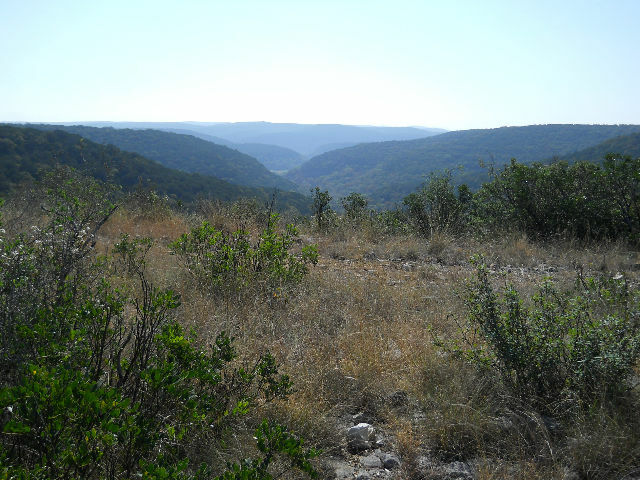 [Saturday] After breakfast, we attended a Ranger's lecture at the Visitor's Center on the geology of the Hill Country. He was knowledgeable of the area and gave a very interesting and informative lecture. He had many rock samples to supplement his talk. He gave a good explanation of the various acquifers and how they are filled and used. 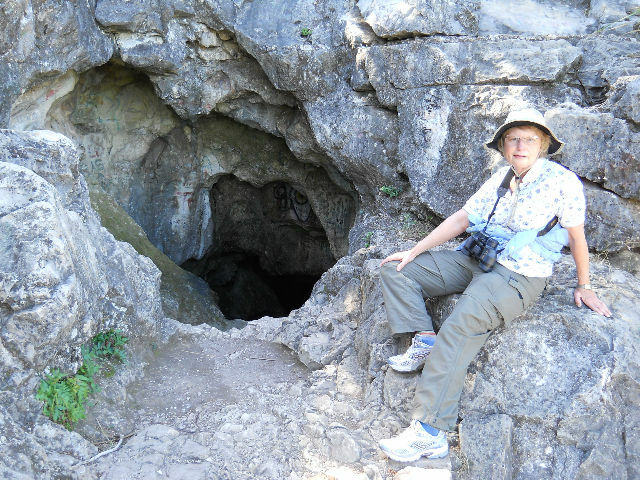 In the afternoon, we hiked the Horseshoe Canyon Trail to Crystal Cave, then over to the Scenic Overlook that overlooks the swimming pool area of the Frio River. This was about a 1 mile hike, but was very steep with many loose rocks that make the climb and descent hazardous. We made it up and down, but not without falling a few times from stepping on the small loose rocks that cause your feet to shoot out. [Sunday] After breakfast we walked the Old Entrance Road that really was the entrance when the park was constructed by the CCC back in the 1930's. 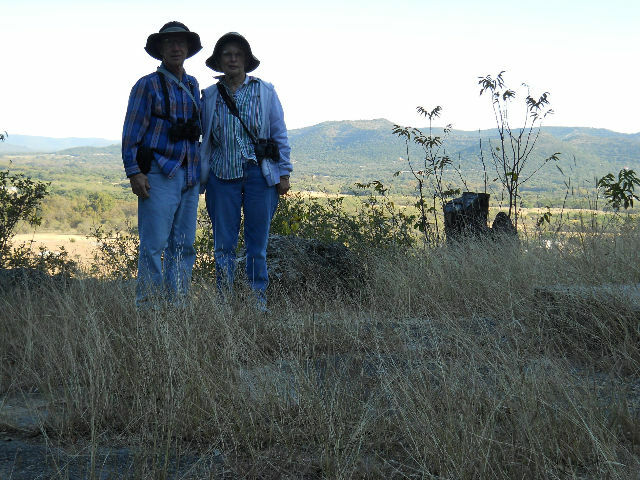 Along the way, we stopped at another of the Scenic Overlooks. 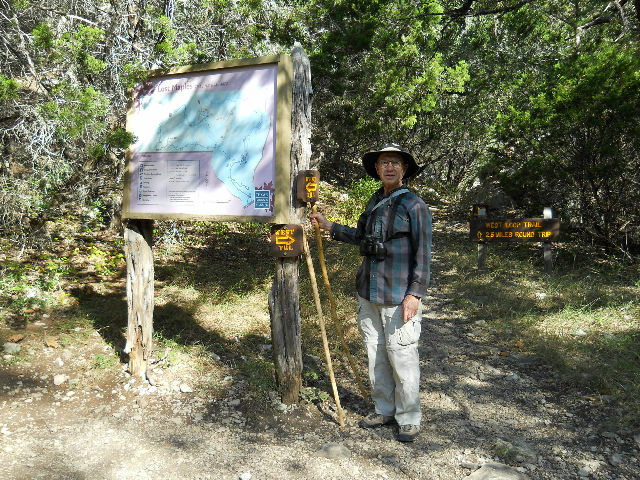 When we got to the old entrance gate, we took the Wild Horse Creek Trail back to the camping area. After eating lunch and washing our laundry in the park Laundromat, we drove down US-83 south to Uvalde, where we shopped at the HEB for a few groceries. 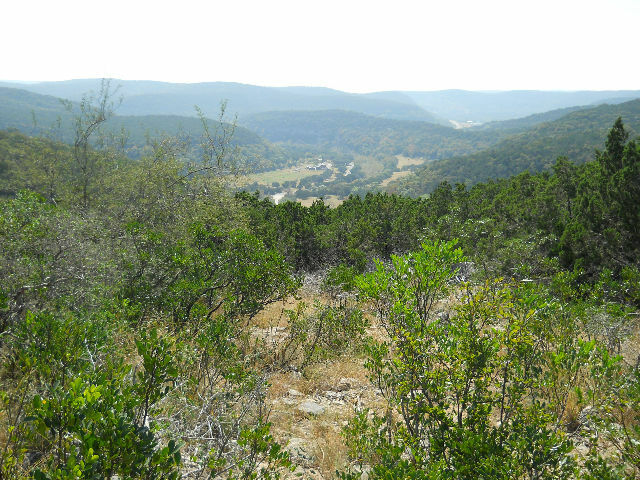 We then went northwest on TX-55 for about 15 miles to Chalk Bluff Park. We were given the "best campsite in the park" by the friendly attendant. That was easy because we were about the only campers there. 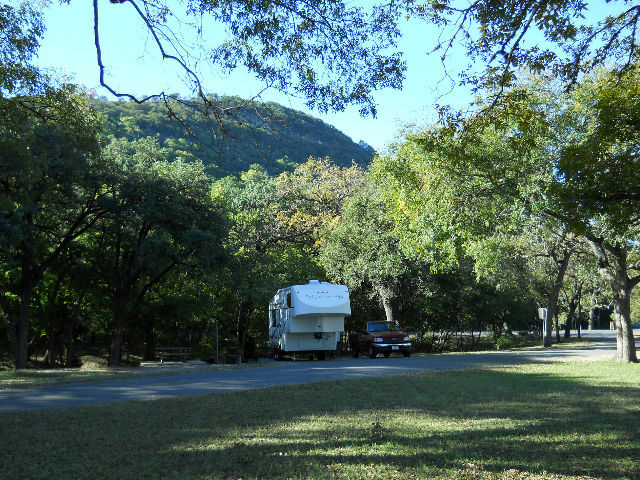 This is a private RV park located on the Nueces River. It is very large, with many cabins and camping spots, from primitive to full hookups. 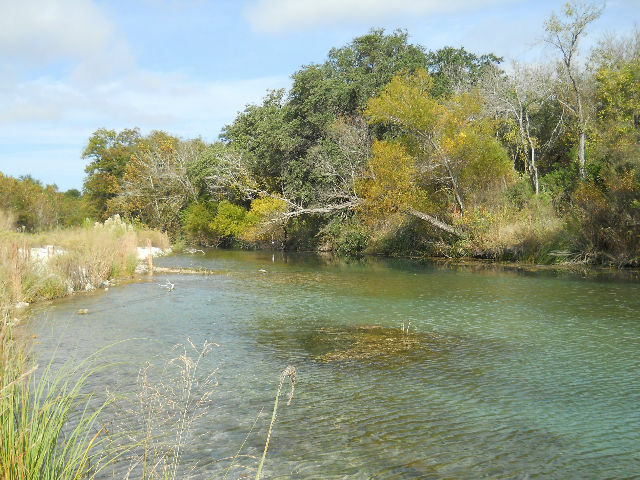 It is a little rustic, bordering on trashy in some places, but it is a great place to enjoy the river and all the abundant wildlife if you overlook the cons. We found it to be ideal for our needs. [Monday] In the morning we walked down-river from our campsite, through the park to the far south end. This is a nice walk (the manager said they have 2 miles of river frontage). 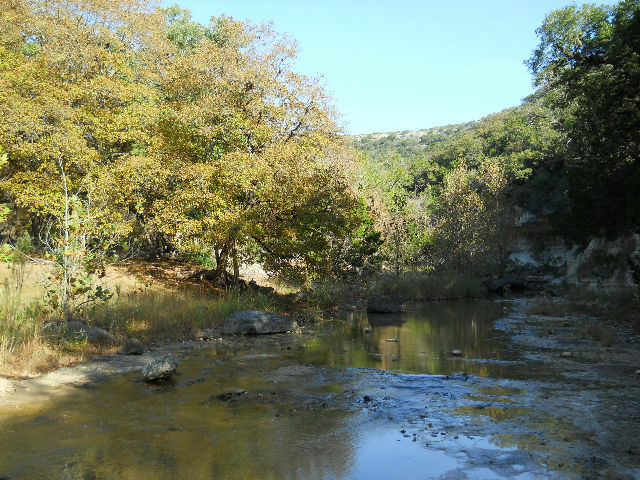 We saw many very colorful Cardinals, along with a Kingfisher, wild Turkeys, wild deer, a Vermilion flycatcher, Meadowlarks, and many other birds along the river and a spring fed creek that originates in the park and flows about a mile to enter the Nueces River. 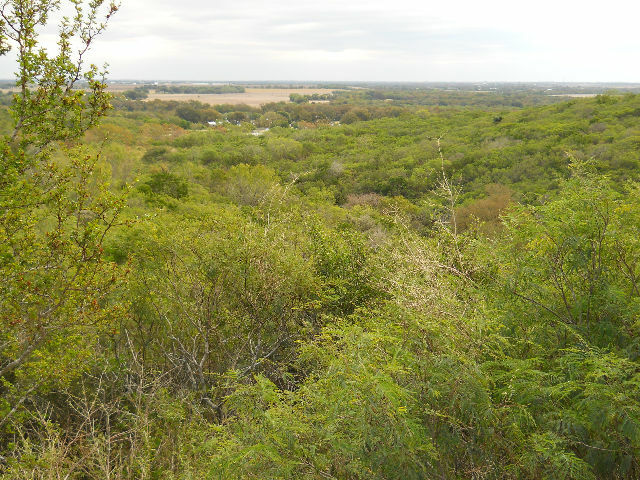 [Tuesday] We left Chalk Bluff Park and went east on TX-55 and US-90 to Castroville. 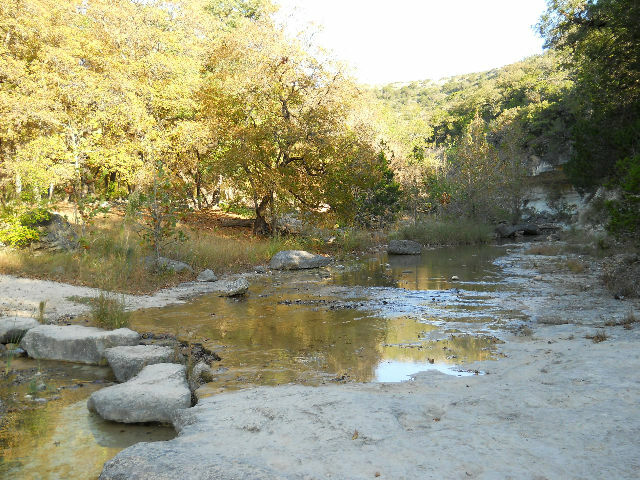 We camped in the Castroville Regional Park, located on the Medina River and run by the city. Before dinner, we drove over to the Landmark Inn State Historical Site to check it out for exploring tomorrow. 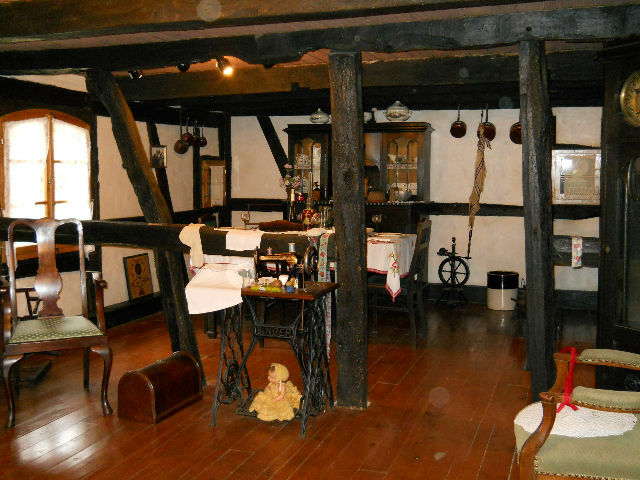 It contains a museum and grounds, and operates as a Bed & Breakfast. 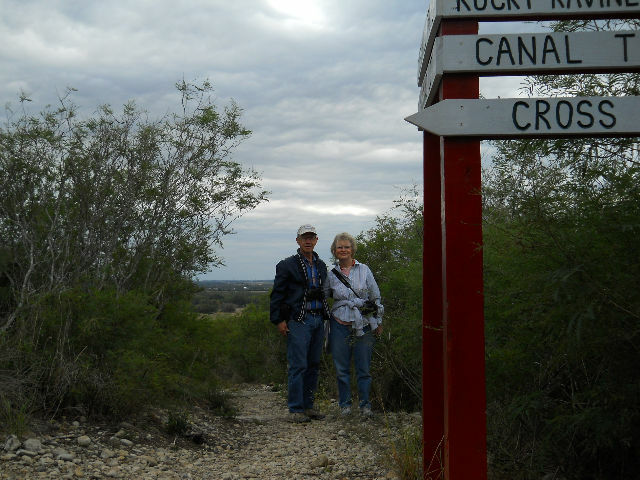 When we returned to the park, we hiked the Birding Trail to the Garden of Roots and then along the Medina River and the Walking Trail back to the trailer. [Wednesday] In the morning while it was cool, we hiked the Cross Hill Trail, Rocky Ravine Trail, Creek Trail, Ernie's Incline, and Rough Draw Trail, forming a loop. We saw some interesting foliage but only a few birds. The trails go up the hill to the top, where a giant white cross stands guard over the city. The trails are good and well marked. After lunch, we drove to the Landmark Inn, which is a few blocks from the park, and took the walking tour of the site. 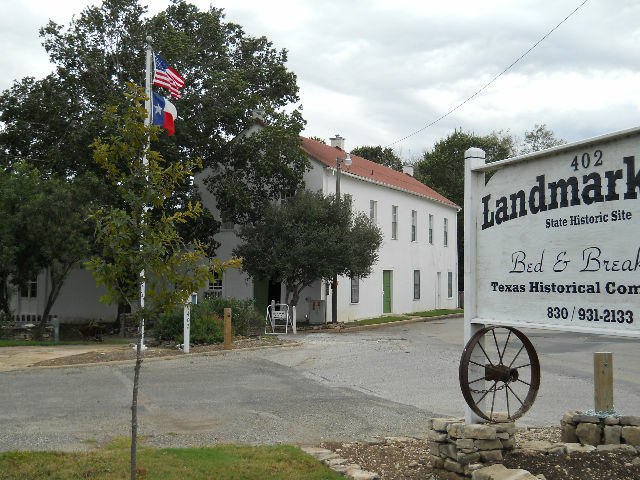 The Landmark Inn is unique among historic sites owned by the State of Texas, in that visitors are welcome to spend the night in one of their 11 beautifully furnished and comfortable guest rooms that for more than a century and a half have welcomed travelers. 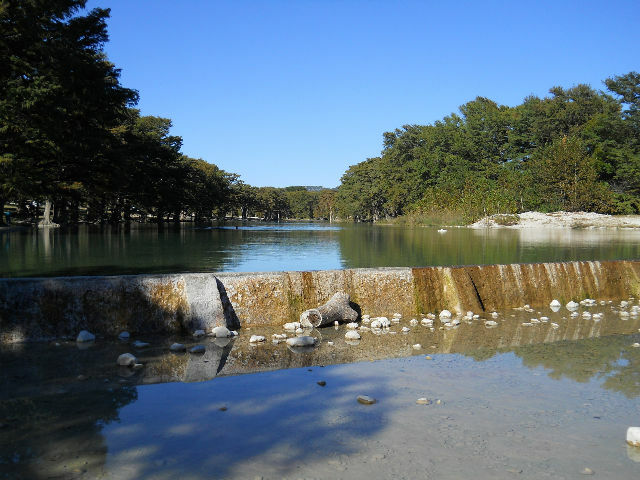 On our tour were The General Store, The Monod Kitchen, The Bathhouse, The Vance House, The Haass-Quintle Mill and the mill dam, on the Medina River. 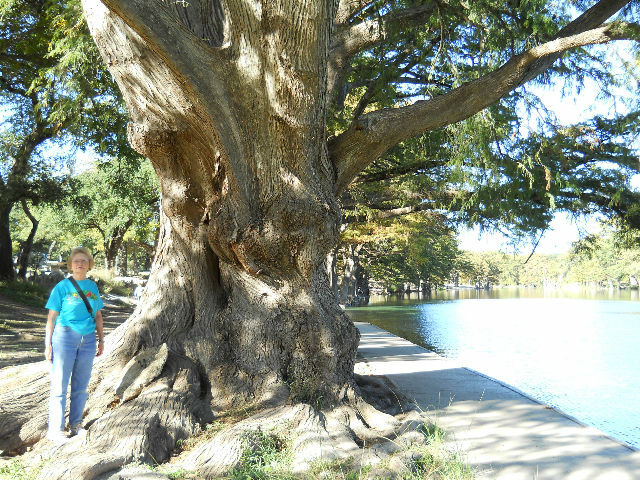 The site was constructed in the 1850's for travelers along the busy San Antonio-El Paso Road. The mill was built in 1854. The mill dam is made of stone and wood and has an underground mill race running from the dam to the mill. Responding to opportunity, entrepreneur Henri Castro recruited over 6,000 settlers, mostly farmers from the Alsace region of France, to come to Texas and settle tracts of his vast 1.2 million-acre land grant. 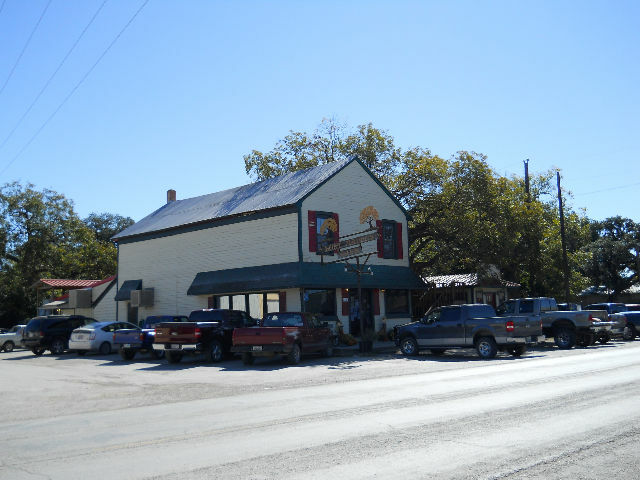 So on September 3, 1844 Castro and 50 men crossed the Medina River here in what now is the Landmark Inn State Historical Site, and founded Castroville. 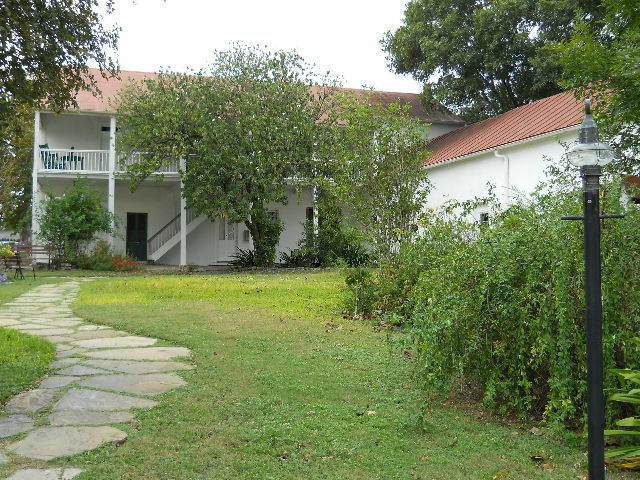 After touring Landmark Inn, we drove over the Medina River bridge to the Steinbach House, which houses the Castroville Chamber of Commerce and a Alsace Museum on the 2nd floor. 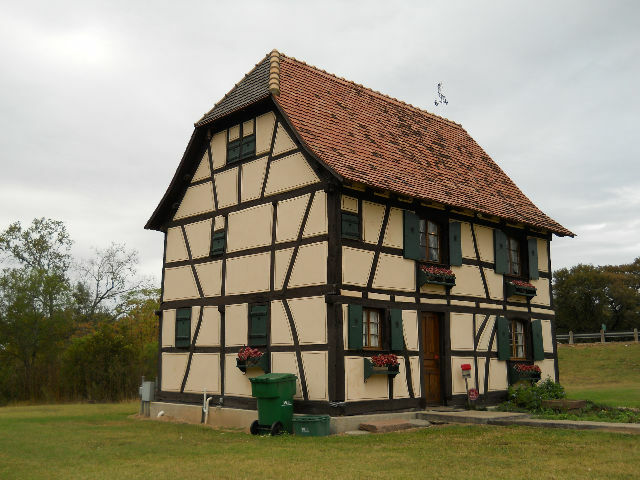 This fascinating house was originally built by the Steinbach family between 1618 and 1648 in the village of Wahlbach, France. In 1988, the owners decided to disassemble the old house and build a new one. 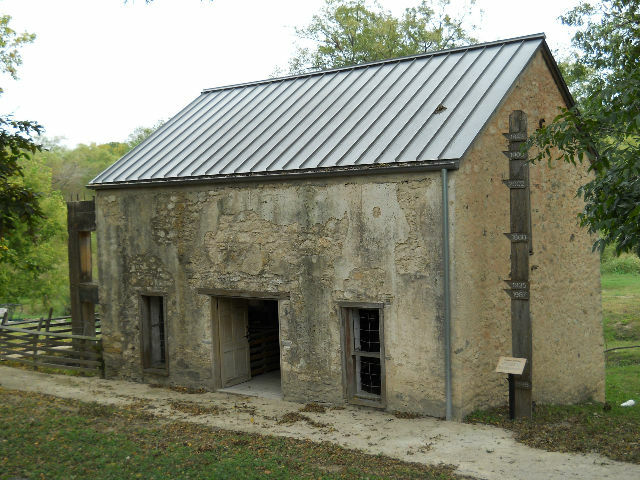 Professor Dulin of Rouffach, France decided to reconstruct it in Castroville, to provide a link between the Castroville Alsatians and the Alsations of France. 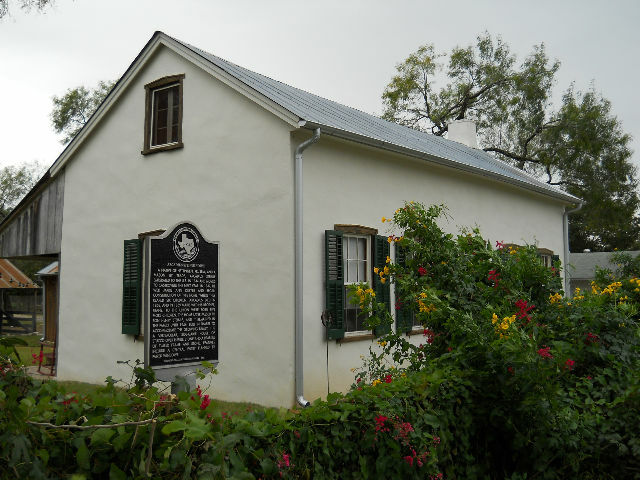 Working over several years, they completed the house's reconstruction in Texas (no nails are used - only wooden pegs hold it together) in February, 2000. This 1,232 square-foot house has two and one-half floors. It is well worth a stop to see pictures and hear the story of the Steinbach house. 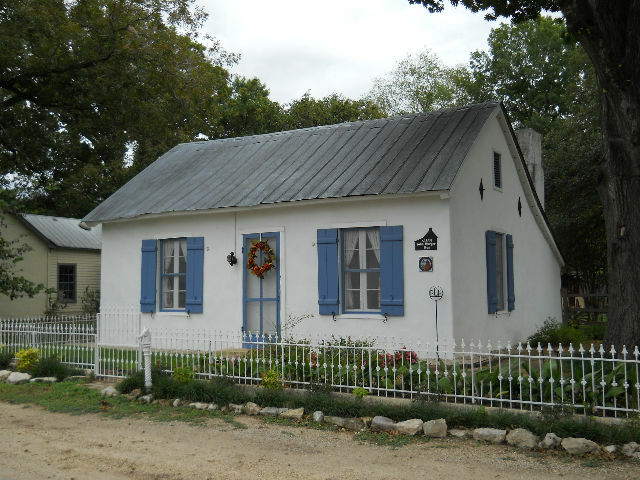 Before the end of the day, we drove along the Castroville historic walking tour, where many of the Alsacian style homes are displayed that were built in the 1840's to 1870's. This is a very interesting community and worthy of a future visit. [Thursday] We left Castroville after breakfast and drove east on US-90 to IH-403, then south on the loop to IH-10, then east to Houston/Richmond. 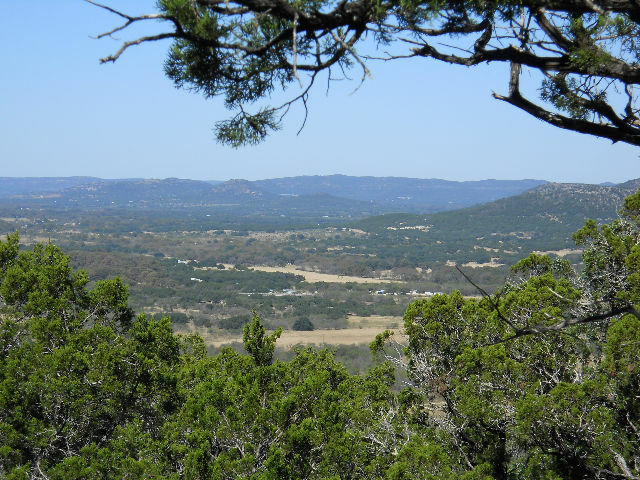 This draws to a close our visit to the Hill Country of Texas. We hope you enjoyed the photos and brief descriptions of our activities. God willing, join us again soon for another RV adventure.